Democrats look to have lost two seats in the Maryland Senate as the Republican drive for five Senate seats needed to uphold a veto by Gov. Larry Hogan easily falls short. No real coattails for Hogan as Democrats run for ahead of him in key seats. In lower Eastern Shore District 38, Democratic Sen. Jim Mathias, the Harry Houdini of Maryland politics, finally met his match in Republican Del. Mary Beth Carozza. As expected, Republican Del. Chris West also gained District 42, but by just 51.8% to 48.2%. Meanwhile, it looks like Kathy Klausmeier has hung on District 8 by 50.6% to 49.3% for Del. Christian Miele. A huge win for Democrats in a highly vulnerable seat that Hogan won by a mile. Dems even picked up a delegate seat as they were doing it. In District 30, Dem Sarah Elfreth looks set to defeat former GOP Del. Ron George by a convincing 54-45 margin in a tough seat with a couple of precincts still out. Dem Sen. Ron Young easily turned back Republican Craig Giangrande’s challenge by 57-43. With two precincts, absentees and provisionals left, Marc Elrich leads David Blair by 375. In a county of over 1 million. Wow! In District 18, Del. Jeff Waldstreicher looks set to win the Democratic nomination with 50% to 38% for Dana Beyer and 12% for Michelle Carhart. Incumbents Kathleen Dumais and David Fraser-Hidalgo look set to be joined by Lily Qi in D15. In D16, incumbents Marc Korman and Ariana Kelly look set for reelection. It’s a tight race between Samir Paul and Sara Love in a tight race for the third slot with Love ahead by 18 votes! The ticket of incumbents Kumar Barve and Jim Gilchrist along with Julie Palakovich-Carr look set to win in D17. Incumbent Sen. Cheryl Kagan endorsed Julian Haffner, who trails in fourth by roughly 1400 votes. In D18, incumbent Al Carr leads the pack with newcomers Emily Shetty and Jared Solomon looking set to join him. Leslie Milano is in fourth but around 1000 votes behind Solomon. One of two incumbents currently trailing is in D19. Incumbent Bonnie Cullison leads followed by Charlotte Crutchfield. Vaugh Stewart leads incumbent Maricé Morales for the third slot by 133 votes. This one is going to take awhile. In D20, the ticket of incumbents David Moon and Jhenelle Wilkins along with newcomer Lorig Charkoudian are set to go to Annapolis. Darian Unger trails in fourth. In D39, incumbent Shane Robinson is struggling in fourth, behind incumbents Kirill Reznik and newcomers Lesley Lopez and Gabriel Acevero. Lopez leads with 3,320 followed by Gabriel Acevero with 3,175 followed by incumbent Kirill Reznik with 3,125. Shane Robinson trails Reznik with 3,032. So with more votes in, it’s looking good statewide for Jealous/Turnbull for Governor with around 39% of the vote in a fractured Democratic field. David Trone looks likely to win the congressional race in CD6 that he lost in CD8 two years ago. He has 40% to 32% for Aruna Miller. In CD8, the unknown Jamie Raskin is edging out the ubiquitous Utam, Paul with 91% to 4% with Summer Spring sneaking into second with 6%. In Prince George’s, Angela Alsobrooks is looking at an easy win over Donna Edwards and Anthony Muse. The Montgomery County Executive race is looking to be the humdinger. Right now, Marc Elrich has 28%, just behind David Blair who has 29% – a difference of 178 votes. In Council District 1, Andrew Friedson seems comfortably in the lead with 30% of the vote. In Council District 3, Sidney Katz is fending off a challenge Ben Shnider with 54% to 46%. 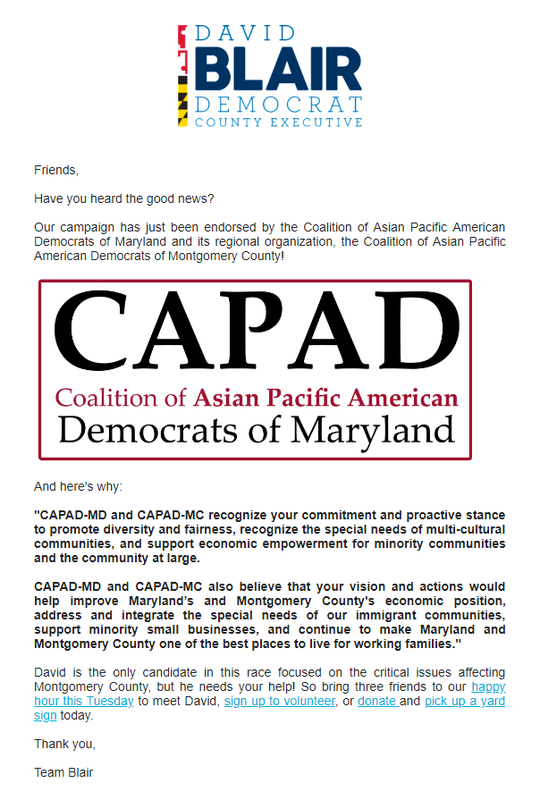 The Coalition of Asian Pacific American Democrats (CAPAD) has endorsed David Blair for County Executive. Their endorsement statement emphasizes economic issues, including the need to “support minority small businesses.” The county has thousands of businesses owned by people of East Asian and South Asian descent. We reprint Blair’s email below. The Metro Washington AFL-CIO has announced endorsements in local races in Montgomery and Prince George’s Counties. They have previously endorsed Marc Elrich for County Executive. Following is their press release. The Metro Council released endorsements in the following races: DC Mayor, Council and Attorney General; Montgomery County Council, Prince George’s County Council and Prince George’s County Board of Education. Congressman John Delaney has endorsed Council At-Large candidate Bill Conway. We are not aware of Delaney endorsing other county-level candidates. We reprint the Conway campaign’s press release below. Bill Conway, candidate for County Council At Large, announced today that he has been endorsed by Congressman John Delaney of Maryland’s Sixth Congressional District. “I am proud to endorse Democrat Bill Conway for an At Large seat on the Montgomery County Council,” Congressman Delaney said. “Bill would bring policy and business experience to the County Council. He is a consensus builder who combines progressive values and a deep commitment to social justice with clear-eyed practicality and fiscal prudence. We need Bill’s leadership on the Council to grow our tax base with new jobs, control our choking traffic problems, and reduce the performance gap in our schools,” Delaney added. “John Delaney is one of the most thoughtful and innovative leaders in Congress. He has served the people of the Sixth District with distinction and would lead our country wisely if elected to the Presidency. I am honored to receive his endorsement,” Conway said. 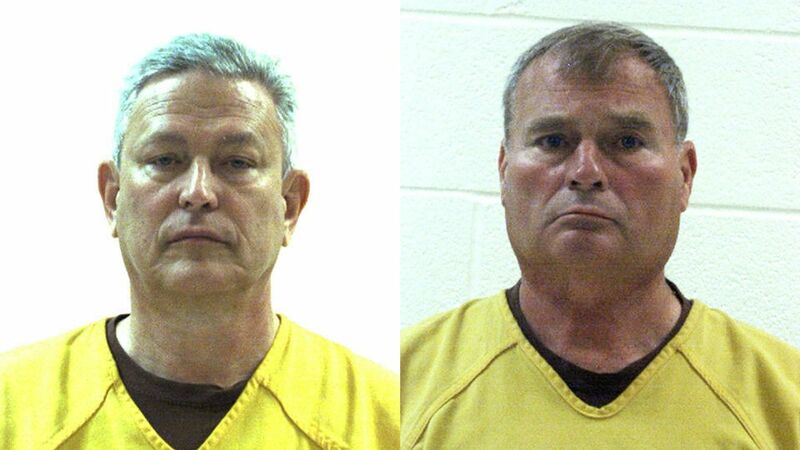 Who Really Deserves Criminal Charges for Ignoring Known Child Abuse? By Adam Rosenberg, Executive Director, and Joyce Lombardi, Director of Government Relations, Baltimore Child Abuse Center. For the past several years, the Baltimore Child Abuse Center has been advocating for a new law that will allow misdemeanor charges against front-line professionals who deliberately chose not to report child abuse. Sounds like an easy sell, but it isn’t. Not in Maryland. Or, at least not in Maryland’s House Judiciary Committee. The bill (SB132 this year) has already unanimously sailed through the Senate two years in a row thanks to Senator Susan Lee and Senator Robert Zirkin. But, despite the efforts of Delegate Carlo Sanchez, State’s Attorney Angela Alsobrooks and several Democrats and Republicans, HB500 is still stalled in the House Judiciary Committee. Why? Partially it’s because leadership there questions the need for yet another law, and partially because many people rightfully struggle with the idea of putting “jail” and “teacher” or “nurse” in the same sentence. But many of the dozens and dozens of people we’ve been talking with – which includes social workers, pediatricians and elected officials in Annapolis – instantly picture who this law is talking about: not your average teacher or nurse, but instead the people who knew but chose to protect themselves or their institutions. “Right!” they say, “like at USA Gymnastics or Penn State.” Yes, bingo. The enablers. Still, others struggle. Instead of seeing the egregious enablers, they see their friends, their kid’s soccer coach, their homeroom teacher, their family doctor. They see themselves. They can picture the predators, sure, the eerily bland face of Larry Nasser or maybe even the bulldog mug of Harvey Weinstein. But they can’t see the quiet cadre of adults standing just behind the predators, the ones who are always there, desperately denying the crimes of the colleague or friend or beloved in their midst. They might see the good doctor who isn’t sure the head trauma was abuse and doesn’t report, or they might see a teacher who didn’t report that a girl felt uncomfortable on her colleague’s lap. They see nuance. They see negligence at best. Also, let’s clarify what has been proposed: a misdemeanor with a max of 6 months in jail or a $1,000 fine. That’s the same penalty you get in Maryland if you board someone’s boat for a second time without permission or if you install an air conditioner without a license ((Crim. Law 6-403; Bus. Reg. 9A-501). Secondly, every other state in the country has a penalty of some sort and most make it a misdemeanor for deliberately failing to report SUSPECTED abuse – except Wyoming and Maryland. In Maryland, after years and years of wrangling and compromise with various legislators and professional associations for doctors, nurses, therapists, etc., this law would only target the worst of the worst: those who ignored KNOWN abuse. The proposed law (HB500) has an “actual knowledge” standard, an extremely high bar to reach, and one that reaches felony status elsewhere. The bar is so high that, for the first time, it has gained support from some professional associations and censure from some activists. We all agree that child abuse needs to be reported, we just respectfully disagree whether Maryland needs a new law to help make that happen. After years of research and experience in the field, we believe that it does and HB500 is that law. If you agree that Maryland’s children deserve better protections too, call the Maryland House Judiciary Committee at 301-858-3488 or 410-841-3488 to share your support for HB500. Today, Seventh State is pleased to present a guest post by Gabe Albornoz. Not long after the final results were announced in the 2016 Presidential cycle a sense of frustration and sadness spread through our county and country. There was a documented increase in reported hate crimes. Not even Montgomery County was immune to the hate and bigotry that was spreading across the country. In response to the tension inflicting our community, County Executive Leggett appointed a team of senior officials from his administration to produce an event that reaffirmed Montgomery County values. I was honored to have been appointed to that committee and serve as the emcee for an event that would be called the The Montgomery Way. The event took place a few weeks after the election on a cold November day on Veterans Plaza. The elements did not stop over a thousand residents from hearing messages of love, tolerance and peace from elected officials, public officials, inter-faith leaders, and students. The Montgomery Way celebrates our diversity and inclusion; promotes economic prosperity for all; ensures the best possible education for all children; and establishes a high quality of life for its residents, especially those most vulnerable. The event reaffirmed everything I love about Montgomery County and played a big role in my decision to run for Elected Office. I have deep Montgomery County roots as a lifelong resident, a graduate of MCPS and have lived in Gaithersburg, Bethesda, Silver Spring, and now in Kensington with my wife Catherine, also a native of Montgomery County, and our four young children. My parents immigrated from Chile and Ecuador; both attended Montgomery College and instilled in me the value of hard work and to treat everyone with dignity and respect. It is a gift to have been raised here. I believe it is my responsibility, elected or not, to pass its opportunities on to all of our children and future generations. I have dedicated my career to public service and fighting for just social policies through my work in the non-profit sector and more recently as a member of County Executive Ike Leggett’s cabinet. I have always considered my work as Director of the Department of Recreation, Chair of the Montgomery County Democratic Central Committee and service in other public sector roles to be a privilege. I have worked to improve the quality of life for County residents by growing our recreational programs, addressing the opportunity gaps among our children through expanded after-school programs, and leading efforts to keep our senior citizens in their homes and active in the community. I have learned much from my hands-on experiences working collaboratively with diverse communities and constituencies and have the skill, passion and perspective to promote respectful engagement and unity in our County. Maintaining the greatness and opportunity of our County will require commitment and effort, which is why I am running for County Council. We are facing difficult challenges including aging infrastructure, a fast-growing school system, a stretched safety-net struggling to keep pace with the complex needs of our more vulnerable residents, growing economic disparity among communities, difficult traffic challenges and unmet affordable housing needs. These challenges come as financial support from federal and state governments are at significant risk of being cut and our local fiscal options to respond are limited. What is not limited is this county’s ability to be imaginative, thoughtful and determined in efforts to address our challenges justly, creatively and effectively. I will bring experienced, inclusive and bold leadership to the next County Council as it carries out its role in charting our county’s future. I believe that elected office is a noble profession and provides a clear and tangible opportunity to impact social change and serve as a bridge between communities and sectors. I intend to work closely with other key public stakeholders including the Board of Education, Planning Board, Executive Branch, State Delegation, Montgomery College and others along with leaders in the Non-profit, Business, LGBTQ, Labor, Faith, Health and Civic Communities to collaboratively address the known and unknown challenges ahead. I humbly seek this office knowing I will follow many other political leaders, among them my current boss, Ike Leggett. I want to thank my friends, family and especially my wife Catherine and our kids for their incredible support. For the next year, I will meet with residents across the County to better understand your interests, aspirations, and concerns. I invite you to join me on this journey. To learn more, please visit my website www.gabeforcouncil.com. Gabe Albornoz is running for Montgomery County Council At-Large.